The US Air Force on Wednesday deployed its B-1B strategic bomber from Andersen Air Force Base, Guam, to South Korea, in a move seen as a show of force against belligerent North Korea and a demonstration of the Seoul-Washington alliance. 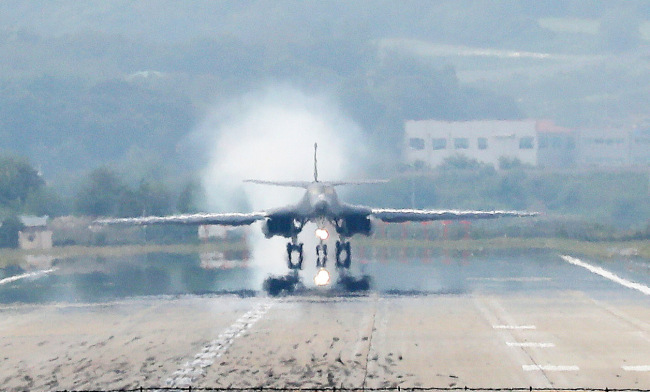 According to the US Forces Korea, two B-1B Lancers flew over South Korea’s airspace and one landed in Osan Air Base. The B-1B, nicknamed “The Bone” in the US military, is a four-engine supersonic variable-sweep wing, jet-powered heavy supersonic strategic bomber with Mach 2 speed. Originally developed for nuclear capacities, the bomber was converted to its exclusively conventional combat role in the mid-1990s. Its payload includes the AGM-158 Joint Air to Surface Standoff Missile and GPS-guided bombs such as the GBU-38. Wednesday’s landing marks the second time in little over a week that the Lancer flew over South Korea. It was reported that the US military had mulled sending the more advanced B-2 bomber, in light of growing threats from North Korea. Pyongyang on Tuesday claimed that it successfully conducted a ground test of a new rocket engine that is assessed to have an upgrade in thrust capacity compared to the one used in a long-range rocket launch in February. US Air Force Gen. John E. Hyten, nominated for the job of the US strategic commander, said that if the communist country’s claims are confirmed, it could represent a missile threat to the US mainland. “If it has that capability, it has the capability to reach the United States. So I’m very concerned about that,” he said during his confirmation hearing at the Senate. Hyten added that while Russia and China are the two biggest threats to the US, “the most likely threats and the most concerning” are North Korea and Iran, given the North’s unpredictability. The incoming commander said the US should do more in terms of missile defense. But the North’s nuclear and missile threats moved up another notch in light of Tuesday’s rocket engine test and its fifth nuclear test on Sept. 9. The test, representing yet another violation of a UN Security Council resolution, was swiftly slammed by China, Pyongyang’s sole major trading partner who has been urging the allies to resume dialogue with the reclusive country. Given the engine demonstration and nuclear tests, some experts say that a new set of provocations may be imminent. They believe it may take place on Oct. 10, which marks the 70th year since the North’s ruling Worker’s Party of Korea was founded. Citing military sources, local media reported Wednesday that North Korea has covered up the second and third shafts of the Punggye-ri test site. One of the shafts, tunnel No. 2 was used for the fifth nuclear test, but the report showed that No. 3 was also covered with a net canopy. The attempt to hide its activities from satellite photos is believed to be a prelude to a nuclear test. The government has stepped up monitoring of North Korea on concerns that it may carry out another nuclear test or a missile launch in the weeks to come. The US Institute for Science and International Security said in Tuesday’s report that the recent satellite images showed continued activity at the Yongbyon nuclear site. But it said the North’s campaign to separate plutonium at the Yongbyon nuclear site may be finished. An earlier ISIS report estimated that Pyongyang could have separated about 5.5 to 8 kilograms of plutonium during the campaign, enough for about one to four nuclear weapons.